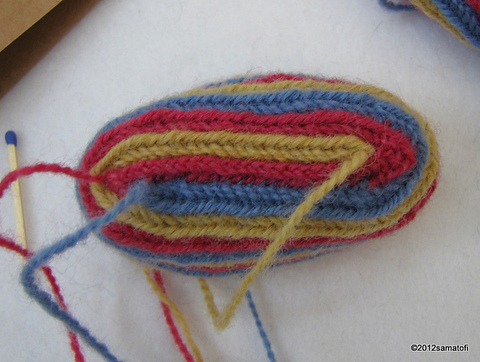 Two fragments of nalbinding, in three-coloured stripes, made with this stitch type, were found in Kaukola Kekomäki, ab. 1200 CE (in Carelian Isthmus, former Finland; area belongs to Russia since 1940; (map). 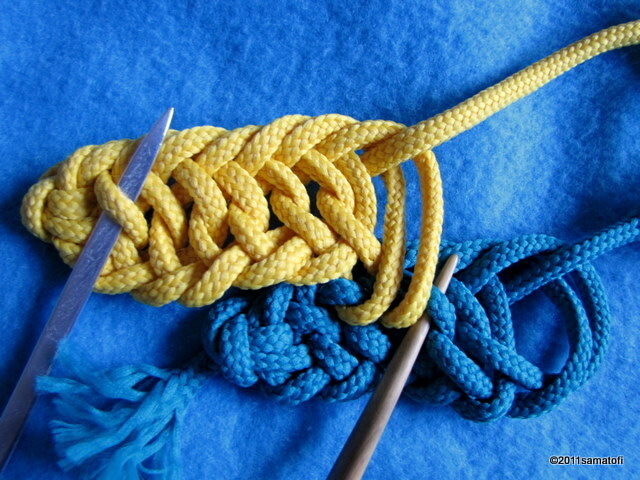 Otherwise similar as the Finnish Stitch 1+2, but the connection stitch is not the more common F1, but M1. Needles on the photo above show how to do the connection stitch M1. An original nalbinding fragment from Kaukola Kekomäki (about 1200 CE) is on display in the National Museum in Helsinki (Finland). The size of the fragment is not much larger than a matchbox. On one end, it is about 3 fingers wide, and on the other end about 2 fingers wide, and the lenght is about 4 fingers wide. The yarn used in the fragment(s) is thin, and the visible part of the colour stripes is about 4 mm (photo (page 27, photo 12). Front side. 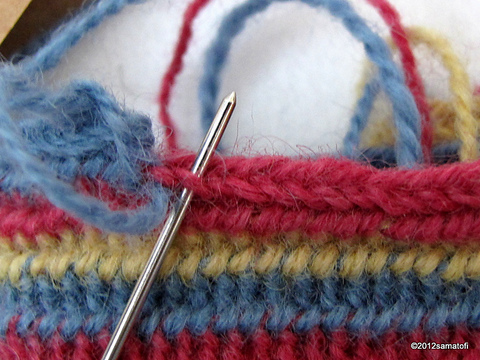 A darning needle was used, and the stitches were pulled smaller in the air between thumb and forefinger. The stitch is done based on the diagrams in Kaukonen's article 1960.